The anime Nausicaä of the Valley of the Wind was released in 1984. For the past few years, there have been rumblings about a sequel. But now, more than ever, it feels like that the long overdue sequel could happen. Here's why. Note: This article contains spoilers about the Nausicaä manga and anime. Nausicaä of the Valley of the Wind is based on Hayao Miyazaki's manga series of the same name. The anime was created before Miyazaki founded Studio Ghibli, and it's still one of his most interesting (and influential!) films. Its mark can still be felt on other anime, manga, and video games. So why now? There are several reasons, some of which can be found in Miyazaki's latest release Kaze Tachinu. The film's Japanese tagline, which appears on the posters, is 生きねば ("ikineba"), which means, "We must live." However, as the film's official site points out, the tagline has a strong Nausicaä connection: It appears at the very end of the manga version's last volume. There's an even stronger connection between the two films: Hideaki Anno. The famed Neon Genesis Evangelion director voiced Kaze Tachinu's lead character, Jiro Horikoshi. Anno also worked on the Nausicaä anime. Earlier this January, Studio Ghibli president Toshio Suzuki wrote about the relationship between Miyazaki and Anno in Bungei Shunjuu (via Akirascuro). Anno, then a dropout from the Osaka University of the Arts, was hired to work on the Nausicaä anime. Good thing for Anno, because he was literally homeless at the time and came to Tokyo with only the clothes on his back. That, and tremendous talent. Anno was in charge of the film's climax, when the God Warrior, a huge colossus, disintegrates. He worked on that 90-second scene for about three months, and Miyazaki was incredibly satisfied with Anno's work. According to Suzuki, the final scene is more or less all Anno's work. This was the only Miyazaki film he worked as an animator on. "When I meet Anno, he sometimes tells me that he wants to create a sequel to Nausicaä," Suzuki wrote (via Akirascuro). "He considers Evangelion a continuation of Nausicaä, done in his own way. It’s amazing how much he was influenced by Nausicaä. Those short three months he spent at our office ended up defining everything about him." But Anno doesn't just want to do a sequel. In the May issue of Bungei Shunju, Anno reportedly said, "I want to do movie versions of a Nausicaä sequel or the seven volume manga as a trilogy." That means Anno could make one sequel or two more films. The anime only drew from the manga's first two volumes, leaving Anno five volumes' worth of material from which to work. Anno isn't alone. 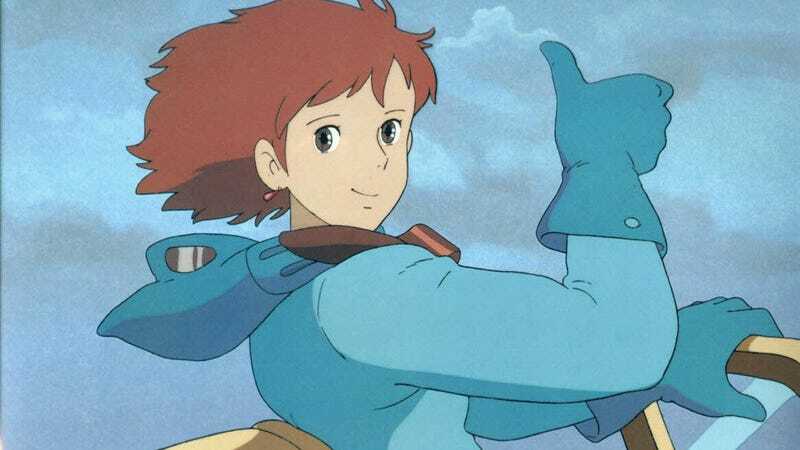 Nobuo Kawakami, a producer at Studio Ghibli, apparently wants a Nausicaä sequel, too. Studio Ghibli's president sounds keen, too. But what about Hayao Miyazaki, the man who created Nausicaä? In a recent interview with Japanese TV, Miyazaki was asked about a Nausicaä. He said, "I think it would be better to keep [Nausicaä] where it is. I have no desire to do it." However, Miyazaki added that because Anno keeps saying over and over again that he wants to it, he thinks "it'd be good" if Nausicaä 2 happened. A few years back, there was also talk about Anno directing Nausicaä 2 and Miyazaki directing Nausicaä 3. Miyazaki, however, canned that idea. If another Nausicaä happens, it sounds like it would be a Hideaki Anno effort. And that's fine by me.